Begin by heating a griddle pan with 1 tbsp oil and gently frying the sweet potato slices. This will take about 20 mins, turn them after 5 mins to ensure even cooking. Put the rice on to cook. Meanwhile, heat 1 tbsp oil in a large pan and add the onion, garlic, chilli and ginger. Cook for 2-3 mins and then add the tomatoes, peanut butter, kidney beans, water and stock. Bring to the boil and leave to simmer for 5 mins. Make the slaw by combining all of the slaw ingredients in a bowl and set aside. Add the spinach and coriander to the stew, cook for a further 2-3 mins until the spinach has wilted. Add the lime juice and check the seasoning. Serve by carefully placing everything *just right* into a bowl for the perfect instagrammable photo and sprinkle over some seeds 😉 Scoff. We’ve been on holiday for a week and eaten out every night. Whilst that was lovely, my body was craving something not deep fried and actual vegetables now we are home. I have an open jar of miso paste in the fridge that needed using up so this stir fry was created. Savoury, filling and nutritious it certainly hit the spot. Heat the oil in a wok and toast the cashews, ensuring they don’t burn. Add the carrots, broccoli, cauli and a splash of water. Cover with a lid to help them steam. Cook for 2-3 mins. Meanwhile cook the rice/quinoa and make the sauce by combining all the sauce ingredients in a jar, stirring well to mix in the miso paste. Add the leeks and miso sauce. Keep covered and cook for a further 5 mins or so until the vegetables are done to your liking (I like mine quite al dente). Serve and feel super smug. These cookies are ridiculously easy to make but they taste AMAZING. You can alter the additions with whatever you fancy or have to hand. 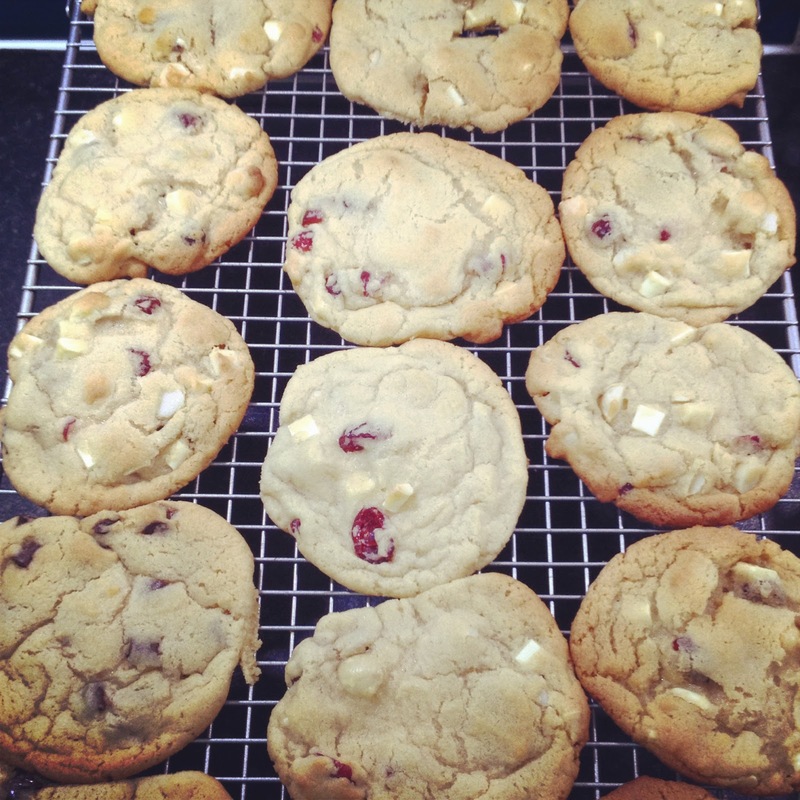 I am in use up my store cupboards before we move mode at the moment so we had macadamia nut, cranberries and white chocolate and plain chocolate chip for the boy who refused the extra addition of ginger or apricots, boo. The recipe is adapted from this one. Begin by creaming the butter and sugars in a free standing mixer for 3-4 mins until light and fluffy. Add the vanilla and eggs and mix thoroughly. Add the flour and mix well. If you’re making just one sort of cookie then add your chosen additions to the dough and work in thoroughly. If, like me, you wanted to do more than one sort simply halve the dough and add your ingredients to each bowl, mixing well. Onto lined baking sheets, place spoonfuls of the dough, well spaced apart. You don’t need to squish them down as they’ll do this naturally as they cook. Bake at 175 degrees for 10 mins until they are starting to go a light brown colour. Leave to cool for 2-3 mins on the tray before attempting to remove as they will be VERY soft. Leave to cool for a further 5 mins or so then try not to eat an entire batch in one afternoon. They freeze well and retain their chewiness upon defrosting. Nomtastic. I love a good nut roast. No, really I do. And I’d much rather see this on a pub/cafe menu for Sunday lunch than some god awful filo pastry thing filled with a suspicious cat sick looking filling going soggy in the gravy. Bleck. So, in an attempt to use up all those itty bitty packs of nuts lurking at the back of my cupboard I concocted this and it was a triumph (well we all enjoyed it and it was delicious cold the next day in sandwiches!). Begin by placing the lentils, quinoa and stock powder in a pan and covering with exactly 1.5 cups water (you’re going to cook them by absorption). Bring to the boil, stir, and then reduce the heat as low as it will go and cover with a lid. Cook for 10-15 mins until the lentils are just done. Turn off the heat and leave to steam for a further 10 mins or so. Meanwhile, fry the onion and garlic until soft. Chop the nuts until half are quite finely chopped and the other half are a little more chunky. 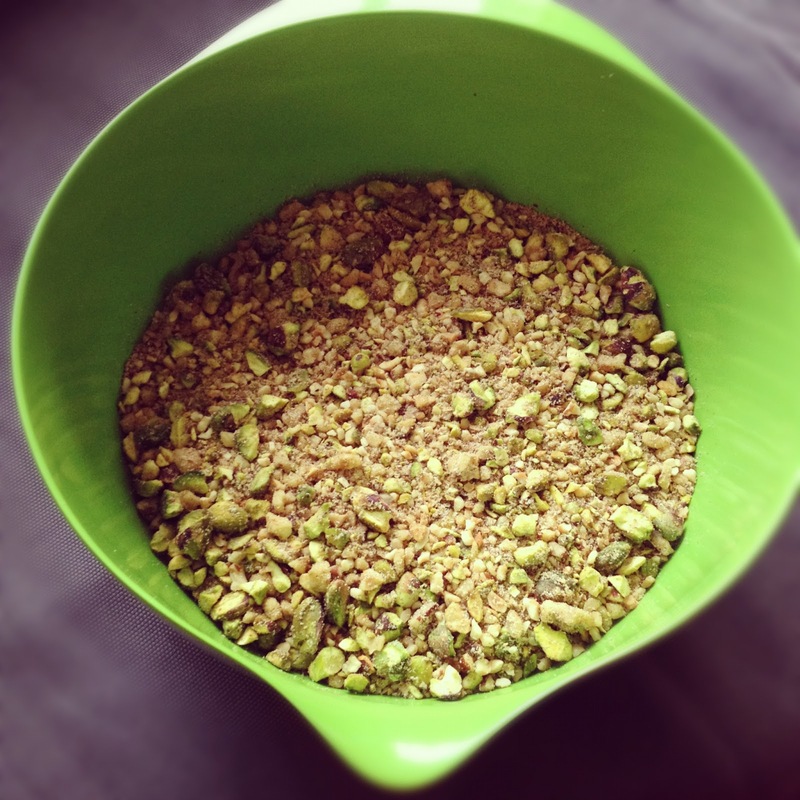 Combine everything in a mixing bowl, apart from the pine nuts, and mix thoroughly. Add a few more breadcrumbs (or even a crumbled weetabix or two!) if the mixture looks too sloppy. You want it to the reasonably firm but not too stiff. Scrape out into a pyrex dish and smooth down. 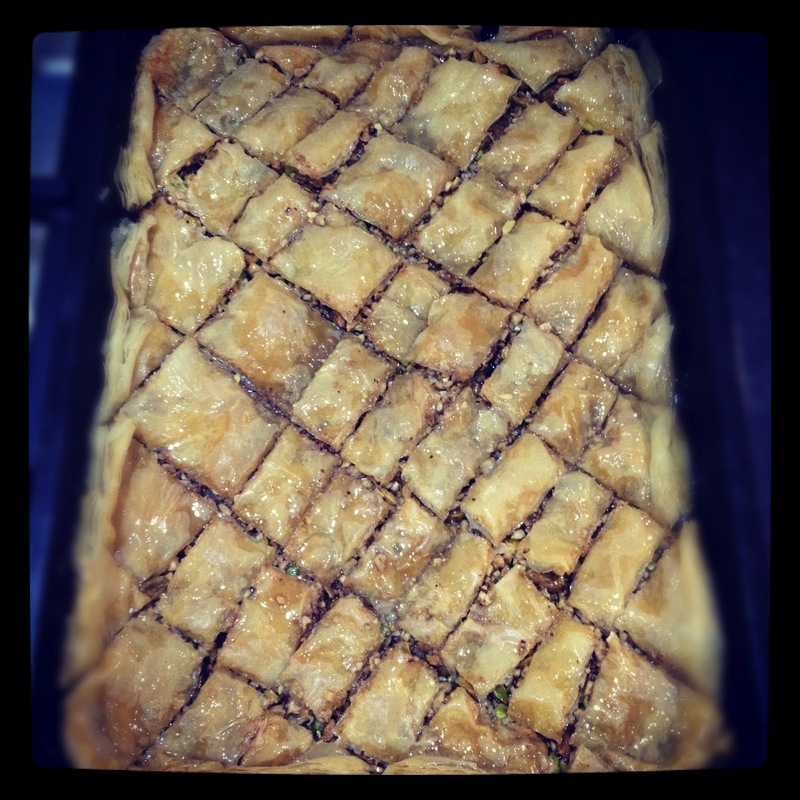 Sprinkle over the pine nuts and bake in a moderate (180 degree) oven for about 45 mins until it’s crispy on top. 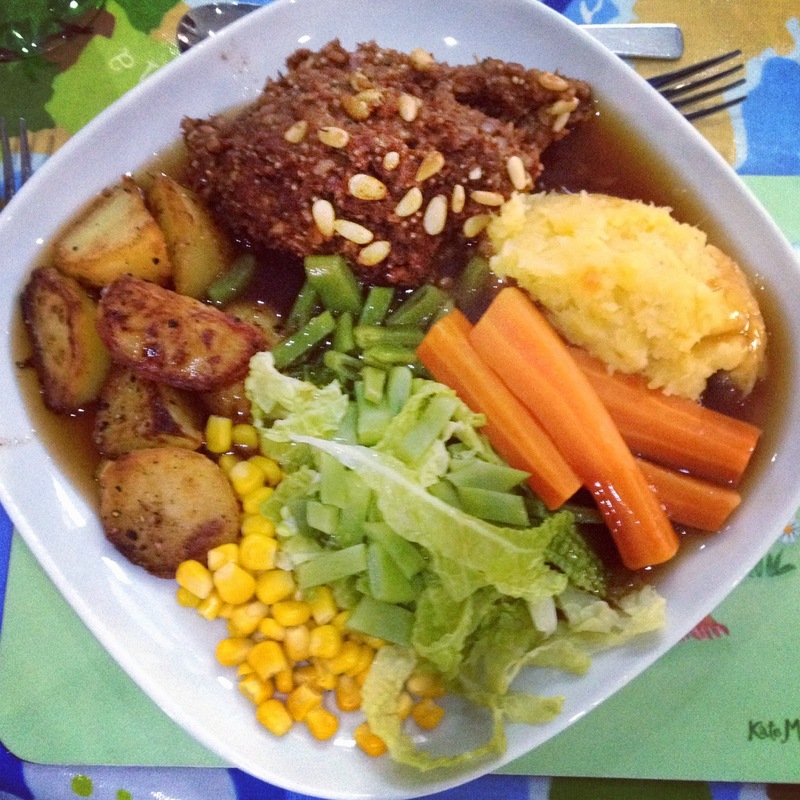 Serve with the usual roast dinner accompaniments. I also like mine with lashings of cranberry or mint sauce. And don’t forget the gravy! Any leftover roast will keep for a few days in the fridge and makes a fab sarnie filling or it will also freeze well. I find it’s worth making a large batch and freezing one half for another day. This is very quick and easy to prepare and tastes lovely. 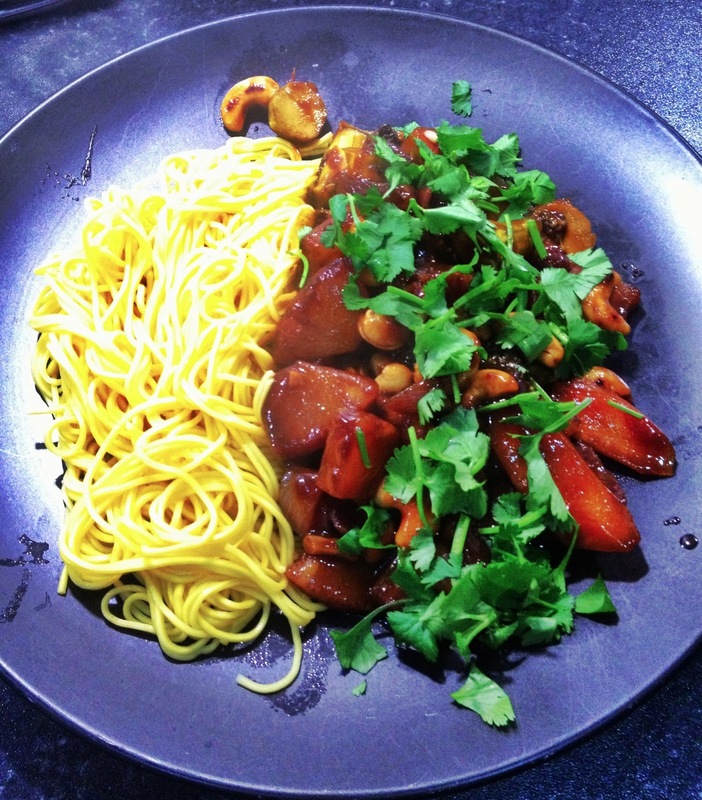 A brilliant healthy mid week supper for all the family. The recipe is based on a Lorraine Pascale one in Fast, Fresh and Easy Food. 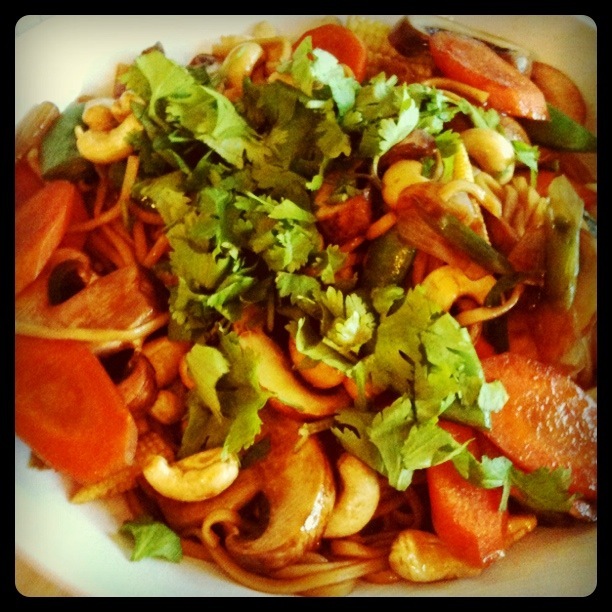 Beging by placing everything apart from the cashews, sesame oil, noodles and coriander into a pan. Bring to the boil then reduce to a simmer and cover with a lid. Cook on a low heat for 5 mins until the veggies are al dente. Remove the lid and increase the heat to reduce the sauce slightly. Toast the cashews in a pan until lightly toasted. Toss through the sesame oil. Boil the noodles for 1-2 mins until cooked. Serve garnished with the coriander. Yummy. I made my first tagine in a proper tagine over the weekend and wanted something deliciously light and sweet to eat afterwards. This hit the spot perfectly and combined delicate middle eastern flavours with a light but tasty finish to the end of the meal. Serve with a light orange and cinnamon sorbet to really intensify the flavours if you want! Place everything apart from the jam and rose petals into a bowl and stir well. Leave to steep for 5-10 mins until the water has been absorbed. Pack into a lightly greased bowl and push down well before inverting on a serving plate. Top with the jam and some rose petals. Place the nuts and butter/marge in a pan over a slow heat and gently toast the nuts. Add the nectar/honey and boil for 1-2 mins until the caramel is a light brown colour and the nuts are deliciously toasted. Take care not to burn or catch the pan! Tip onto a well oiled surface and leave to cool. 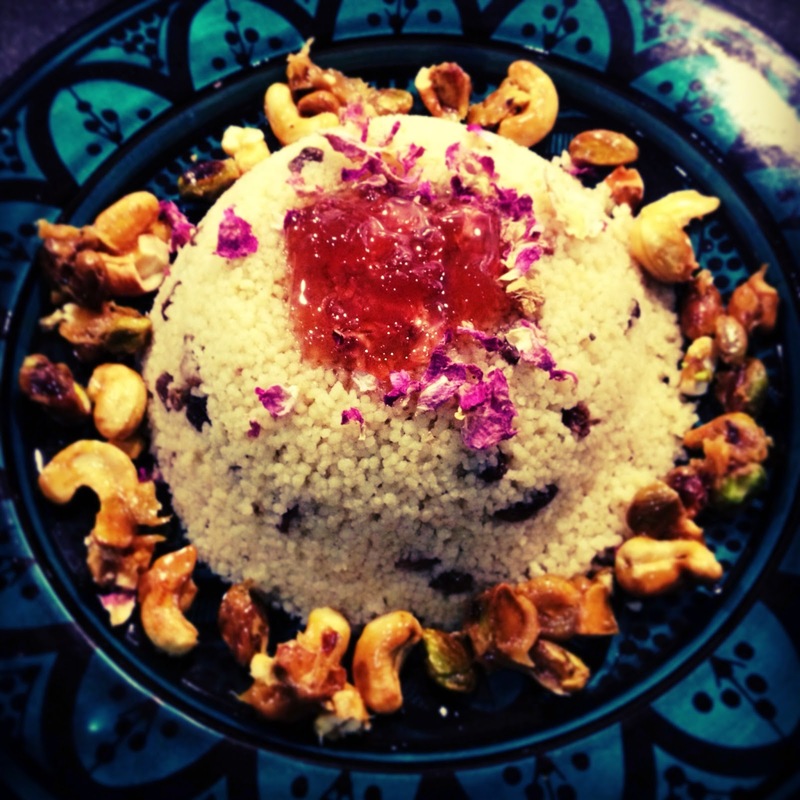 Break into bite sized pieces once cooled and scatter over the cous cous. This is not a dish for the faint hearted, cos when you see how much butter it uses you would be forgiven for having a heart attack there and then… But, you’re supposed to eat in teeny tiny slices so it’s all OK really. Promise. This has been made for the forthcoming Shipley Slump taking place on the 23rd Sept. Good job I’m on a diet or I’d be scoffing it all now and having to make another it smells SOOOOOOOOOOOO divine!!!!! Begin by brushing the sides and base of a swiss roll tin with butter. Lay 9 sheets of pastry into the tin, taking care to brush thoroughly and evenly with melted butter. Take the nuts, sugar and spices (I can’t resist adding a picture here they looked so pretty!) and sprinkle half the mixture over the butter pastry. Place another two sheets of pastry on top, again brushing each carefully with butter, and top with the remaining nut mixture. Place the remaining sheets of pastry on the top, buttering each layer. Trim the edges and brush the top with the last bit of butter. Cut into small pieces using a sharp knife. Bake in a moderate (140 degree) oven for 30 mins. Check, rotate the tin to ensure even cooking, and turn up to 150 degrees. Cook for a further 30 mins until the pastry is light golden brown, crisp and fully cooked. Whilst the baklava is cooking, make the syrup. Place the water, sugar, honey, cloves and cinnamon in a pan and slowly melt. Once all the sugar is dissolved, bring to the boil and boil fast for 15 mins until the syrup is reduced, thickened and gorgeous. Carefully add the lemon juice, rose and orange flower waters (it will hiss and spit when you do this) and leave to cool for a bit. Yep. You guessed it. This is yet another recipe from Mary Berry’s Baking Bible. P50 this time. And another recipe made and adapted to use up the contents of my cupboard. I had no apricots so I substituted dried blueberries instead. And I also added vanilla because I adore the mix of almond and vanilla together. My boyfriend declared this cake as GORGEOUS and was rendered speechless by it’s deliciousness. Try it, you won’t be disappointed. Line a square baking tin with parchment paper. Mix everything apart from the apples, blueberries and almonds together well. Fold in the fruit and then scrape into the lined tin. 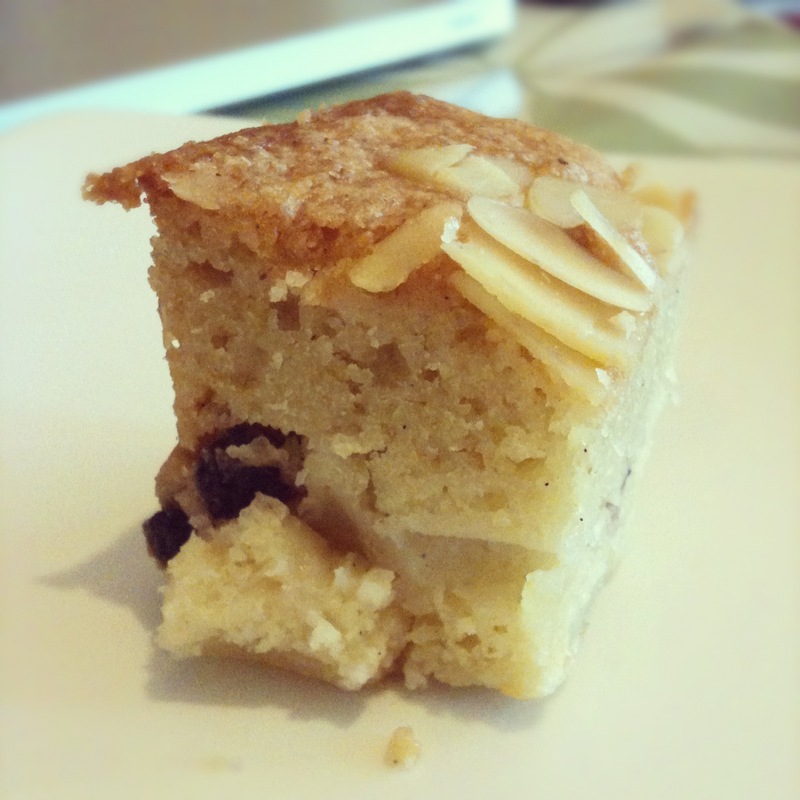 Top with the flaked almonds and bake in a moderate (160 degree) oven for about an hour, till risen and golden. Leave to cool and then eat. It’s nice warm or cold and also freezes well. OK it’s only infamous cos it’s got courgettes in it and it’s called bread and people on twitter, instagr.am and facebook wanted the recipe. 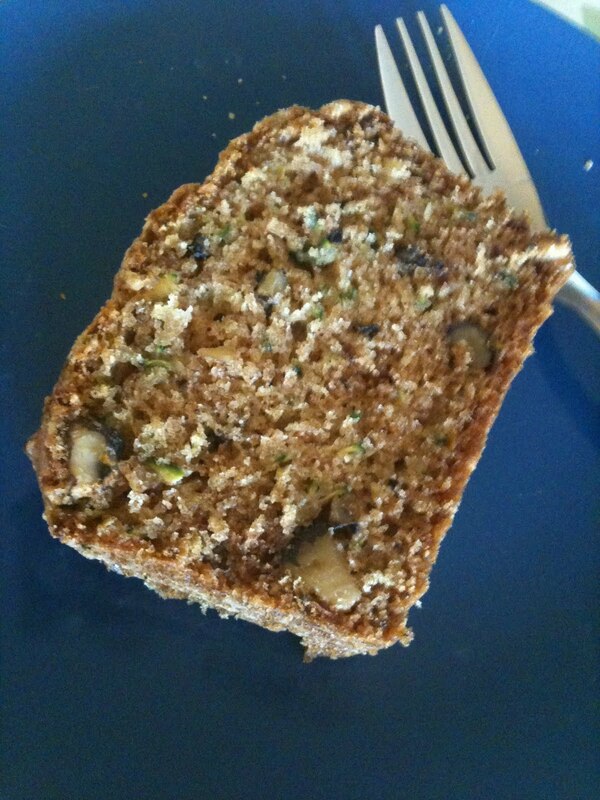 Maybe it should be called intriguing courgette bread instead… Anyway, I digress. This is a Rachel Allen recipe (p72 of Bake) and jolly fine it is too. A lovely crunchy sugary topping forms during baking and the whole flat smelled of yummy spices as it cooked. It freezes really well and is great for lunch boxes. As the week goes on it can be toasted and topped with butter or honey or whatever you fancy really. Peanut butter on it is suprisingly good. Honest.